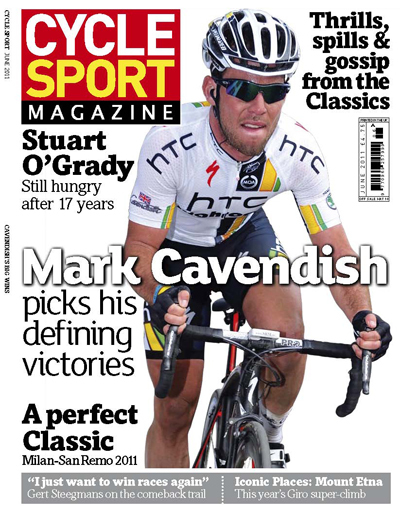 Cycle Sport June: Out now! Cycle Sport June is out now, and it’s packed with great features and photography. Plus a 32-page Giro d’Italia guide, and a 16-page Giro picture special, and three 8×10 retro prints! A few months ago, in Cycle Sport February, we ran a feature entitled ‘The Greatest Winners,’ which listed the riders who have won the most bike races. Eddy Merckx came out on top, with an incredible 333 wins. In joint 50th place, with 62 wins, was Mark Cavendish. He’s won two more since then, which raises him to joint 48th place, at the age of 25. 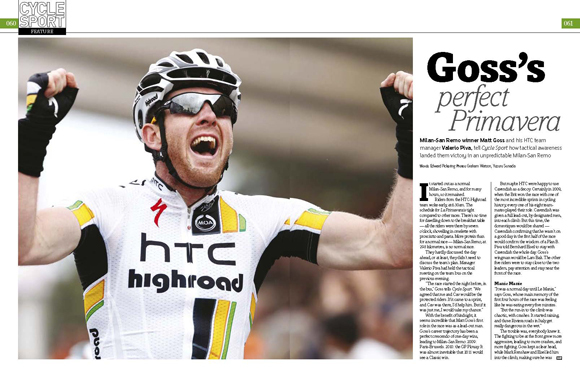 Alasdair Fotheringham spoke with the HTC-Highroad sprinter recently, and asked him to tell us about his favourite victories, for our lead feature, Cavendish: My best ever wins. 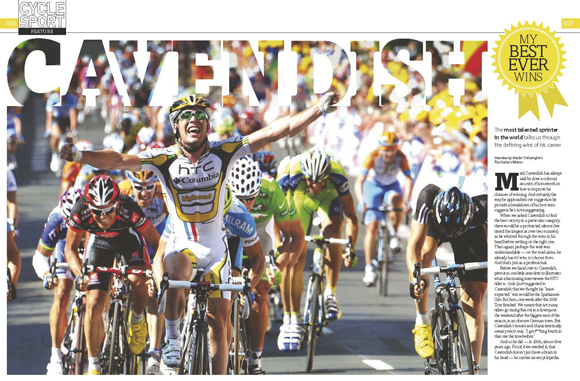 Cavendish pinpointed nine, which were all special for different reasons. He identified his most difficult win, his luckiest win, his proudest win, and his most surprising win, among others. Among the victories he listed were his incredible Champs Elysées win in 2009, his mugging of Tom Boonen at Scheldeprijs in 2008, and surprisingly the Vuelta team time trial win of 2010. Nobody explains Cavendish’s wins better than Cavendish himself, so we’ve presented the entire feature in his own words. We wonder how many of his best wins to date will be supplanted by those he inevitably takes over the coming season. The difference between the Tour de France and the Giro d’Italia is like the difference between a number one pop song and a piece of jazz music. Yes, one is more commercially successful than the other, but which is really best? It seems the more committed the cycling fan, the more he or she will lean towards the Giro. 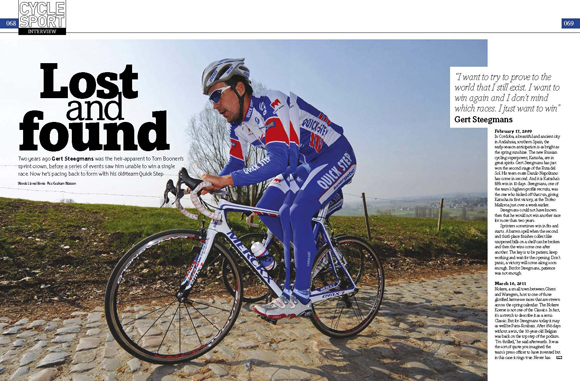 We’ve got a separate 32-page preview of the Giro d’Italia. Our stage-by-stage guide features the erudite prose you’d expect from our writers, with background knowledge, route coverage, culture, history plus a guest expert for each stage. Our experts include defending champ Ivan Basso, Italian champion Giovanni Visconti, Marco Pinotti,, multiple stage winner Robbie McEwen,, former Giro winners Andy Hampsten and Paolo Savoldelli, and race favourite Vincenzo Nibali. 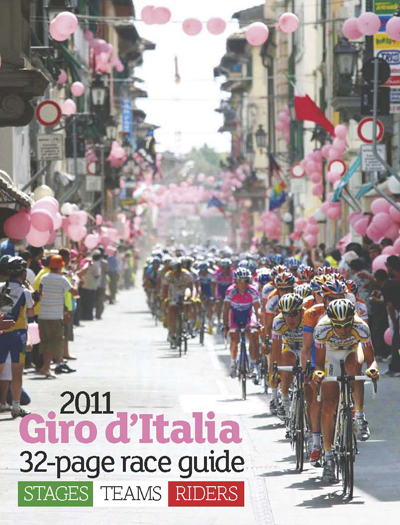 There’s also a feature on Giro Culture, a guide to the summit finishes of the race and a look back at the 2010 race, the best Giro ever. 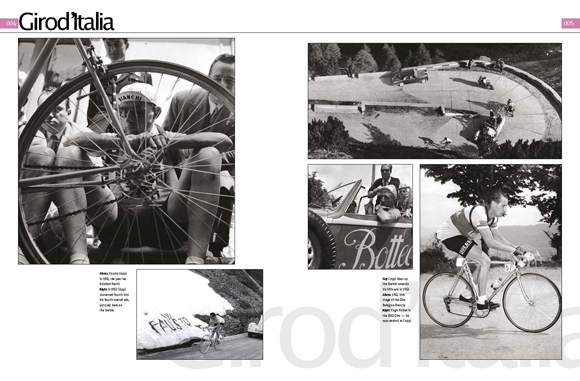 On top of that, there’s a 16-page photo special from the history of the Giro, featuring stunning photography of heroes past and present. We can only hope that you enjoy looking at the pictures as much as we enjoyed choosing them. And finally, in case you weren’t sure that we are spoiling you with our Giro coverage, we’ve thrown in three 10×8 photographic prints of possibly our three favourite pictures of the Giro. Australian Stuart O’Grady is one of the most experienced, talented and respected riders in the world, and his career has had so many different acts, Shakespeare could write a play about it. He was the golden boy of the Australian track programme of the 1990s (and has an Olympic gold medal to prove it). He won team time trials and Tour bunch sprints in his early professional career. He morphed into an all-rounder who came within a whisker of winning a Tour green jersey. Then came specialisation in the Classics, with victories in Paris-Roubaix and the HEW Cyclassics race. And finally, he’s become Cancellara and the Schlecks’ right-hand man – a domestique deluxe and road captain in both the Classics and the Tours. Our writer Gregor Brown interviewed O’Grady, who looks back over his career, tells us that he’s not ready for retirement yet, and doesn’t quite explain what happened at the Vuelta with Andy Schleck last year, when he and his team leader were thrown off the race by manager Bjarne Riis after an impromptu mid-race night out. We may be looking forward to the Giro, but there has already been some exciting and absorbing racing this season. We look back at the opening Classic of 2011, Milan-San Remo, through the eyes of winner Matt Goss and his manager Valerio Piva. Goss gives us his account of making the crucial split over the Manie climb, while Piva gives us the view from the team car. Goss was heavily outnumbered in the lead group – no other HTC rider made it through the carnage. But he and Piva explain how they turned this to their advantage, resulting in a famous win for the Australian. 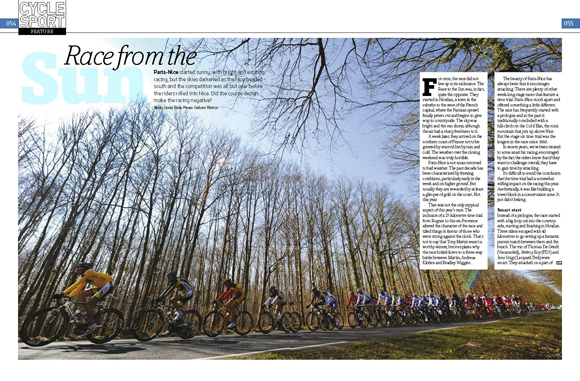 There’s also an in-depth analysis of Paris-Nice by Lionel Birnie. The Race to the Sun featured a long time trial for the first time in many years, and in our opinion, the race was worse for it. The route has always favoured attacking, anarchic riding, making it one of our favourite races. In 2011, the time trial seemed to have a chilling effect on the race – half the week was spent waiting for it, then the last few days saw defensive riding from the top order. Perhaps ASO will restore (in)sanity next year. Can you remember what happened the last time Gert Steegmans rode in the Tour de France? He won the final stage of the 2008 race, but he hasn’t been back since. The Belgian is one of the most enigmatic riders in the peloton. We wouldn’t wish some of the bad luck he’s experienced on a rival cycling magazine, let alone a thoughtful, sensitive rider like Steegmans. He tells Lionel Birnie about his wilderness years with Katusha and RadioShack, where injury, bad luck, and the strange history of an anti-doping contract kept him away from the sport for two seasons. Now back with Quick Step, he’s eager to make up for lost time. 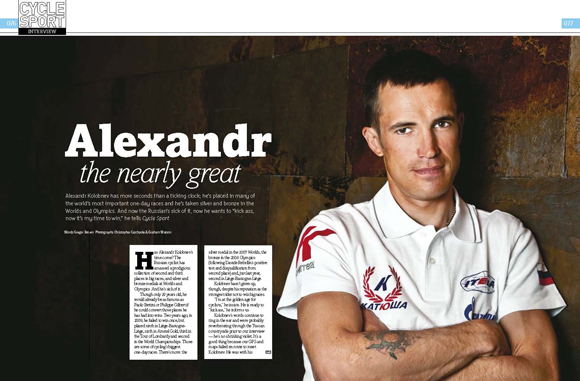 Speaking of enigmatic riders, we’ve also interviewed Katusha’s perennial runner-up Alexandr Kolobnev. We’ve lost count of the number of times we’ve watched Kolobnev make the second-last attack in a major hilly Classic – the Russian is a Zelig-like presence in the lead group of these races. But somehow, the winning move has always been the next one. Kolobnev has come in the top three of the Worlds (twice), Liège, San Sebastian, the Olympic Games and Lombardy. But his only major one-day win remains the 2007 Eroica. Will 2011 finally see him crack a Classic? We went all the way to Japan to visit Fumiyuki Beppu during the off-season. The RadioShack rider is an interesting mix of Japanese and international – he’s lived in France for the best part of a decade, and his English is accented with the Flemish spoken by many of his team staff. He tells Edward Pickering about his ambitions to win, and of his proudest moments, during the 2009 Tour when local knowledge and tactical nous got him and several team mates into the famous break to La Grande Motte, early in the race. Lord knows we’re tired of working in an office – the daily grind and regular Powerpoint presentations at CS Towers are almost too much for us to bear. 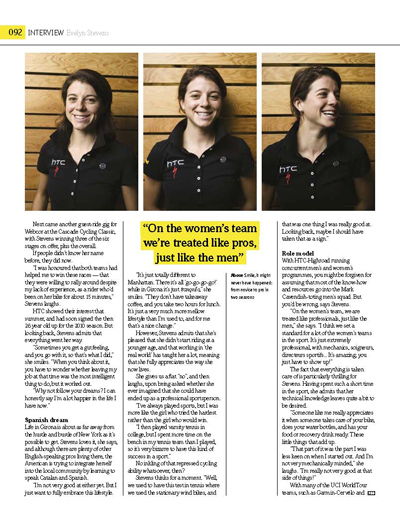 Unfortunately, what HTC-Highroad rider Evelyn Stevens did probably isn’t possible for us. Stevens took up cycling, left her office job and became a professional cyclist. She borrowed a bike to take part in a cyclo-cross race in late 2007, got hooked, discovered that she had aptitude and talent, and within two years she was a professional cyclist. In 2010 she signed for HTC, and she is now racing at the very highest level. Stevens has experienced a a dizzying rise, and she tells Ellis Bacon about life on one of the biggest women’s cycling teams in the world. Iconic Places continues our Giro d’Italia theme, with a visit to Mount Etna. The Giro pays a visit to the famous volcanic climb in 2011, and we celebrate its history in the race. Race favourite Vincenzo Nibali is from Sicily, and he tells us about this unique mountain – he first rode up it at the age of 15. “It’s a beautiful experience,” he says of riding up it. Will he win on his ‘home’ mountain in 2011? Finally, Chris Sidwells talks to Tom Steels, Quick Step’s sprint coach for our Pro Performance feature. Steels was one of the best sprinters of the late 1990s, and he’s now coaching one of the strongest sprinting teams of 2011, with Tom Boonen, Gerald Ciolek and Gert Steegmans among his charges. Plus…All our regular features – Shop Window, with the latest ostentatious bling in professional cycling; Graham Watson on the early Classics and stage races; Broomwagon gets hold of the secret diary of a team PR, and covers the launch of an FDJ rider’s perfume range: Chainel No. 5; Q&A with Michael Matthews, perpetrator of the best dance moves in the peloton; top 10 odd racing classifications; Geraint Thomas on his ride in Dwars door Vlaanderen and much, much more. That’s 10 outrageously high-quality features, plus 48 pages of brilliant Giro coverage, plus three 10×8 photographic prints, for the irrationally reasonable price of £4.75. 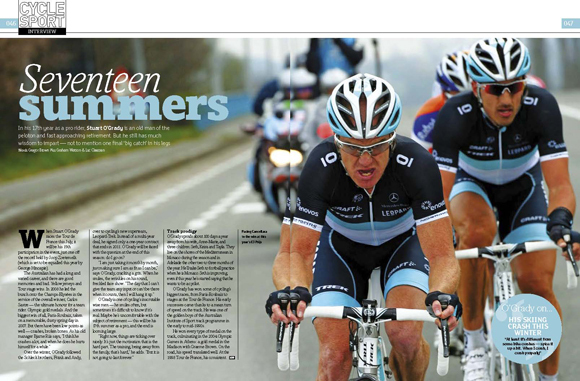 Cycle Sport June: It’s an extravaganza. 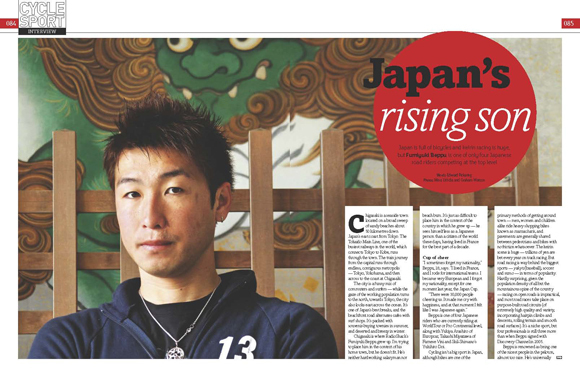 Cycle Sport June is on sale in the UK from Wednesday May 13, and will be available later in the US.